The tour starts at the Escher in het Paleis Museum (1), housed in the former palace of Queen Regent Emma. The route follows the Lange Voorhout and Tournooiveld, before returning to the Lange Houtstraat. You will pass the Plein square, with its large statue of Willem van Oranje. Cross the Kalvermarkt to the Turfmarkt. From here, enter the city hall of The Hague known as The Ice Palace with its impressive Atrium. The area surrounding the Spui is a district of shopping streets. Follow the route via the Rabbijn Maarsenplein[KB1] square and the Hofplaats as far as the Haagse Passage, a unique and historical monument. At the end of the Vlamingstraat turn right onto the Jan Hendrikstraat which later becomes the Torenstraat. Here cross over to the Kerkplein square and continue on to the Dagelijkse Groenmarkt, the site of the Oude Stadhuis. This town hall consists of two different elements; the first was built in 1565 while the extension at the front was added in 1733. From here, the route takes you towards the Buitenhof . From the Buitenhof pass through the gateway into the Binnenhof. For centuries, the Binnenhof has been the very centre of Dutch politics. One of the buildings on the Binnenhof is the the Hall of Knights that dates back to the 13th century. The Ridderzaal is a listed monument and at one point in its history was used as the meeting hall for the Upper House of the Dutch Parliament. Beneath the Ridderzaal is a dependence of the Hague Historical Museum (21), featuring the Prinsjesdag Experience, an exhibition that celebrates the state opening of parliament each year. Next to the Binnenhof is the Hofvijver. From here you have an excellent view of the To tower which since 1982 has housed the offices and workroom of the Dutch Prime Minister. After walking around the Hofvijver and through the shopping streets, you will pass along the Papestraat as far as the Oude Molstraat.. Continue towards the Paleistuin gardens; if you ring the bell at the last door on the left you may be granted access to the palace gardens. These are certainly worth a visit. The Paleistuin gardens are in fact a park that fills the space between the Noordeinde Palace and the Prinsessewal. The gardens date back to 1649 and continue as far as the Royal Stables. 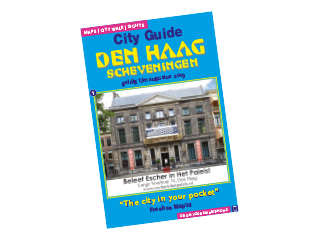 Upon reaching the Hogewal, the route will take you past the art and architecture centre Stroom Den Haag (14). Turn left onto the Zeestraat which houses the Panorama Mesdag (3). ‘Step into the Netherlands’ largest painting’. From here walk back down the Zeestraat which becomes the Noordeinde. This street is home to a number of historically authentic courtyards. On the route you will pass O’Casey’s Irish Pub, the best Irish Community Pub in the world (9). Via the Hartogstraat and Lange Voorhout, you walk towards the Houtweg, you will end up on the Prinsessegracht, the site of the Meermanno museum (52), the world’s oldest book museum. From here follow the Lange Houtstraat as far as Holland Souvenirs (28), the ideal place to buy small souvenir gifts or more special items. Follow the route along the Fluwelen Burgwal, and you will soon find yourself back at the starting point of the tour.